An elegant and minimal piece, the Aphelion entrance table combines straight lines and gentle curves. A long and sturdy top projects over the legs with a chamfer detail making it appear light at the extremities. 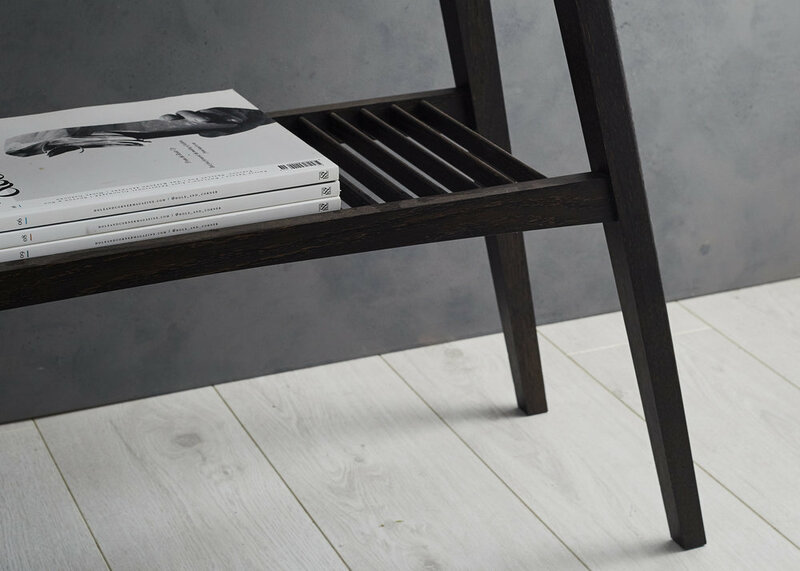 Below this, a delicate slatted shelf sits between legs that have been hand shaped to produce a radius on the outside corner that gradually tapers to a square foot. This piece is made from solid oak and available finished with a special white oil that retains the natural colour of the timber or ebonized using the traditional method of iron acetate which reacts with the tannin to produce a lustrous black finish with accentuated grain patterns. Proud to have been awarded a guild mark for excellence in design for manufacture.